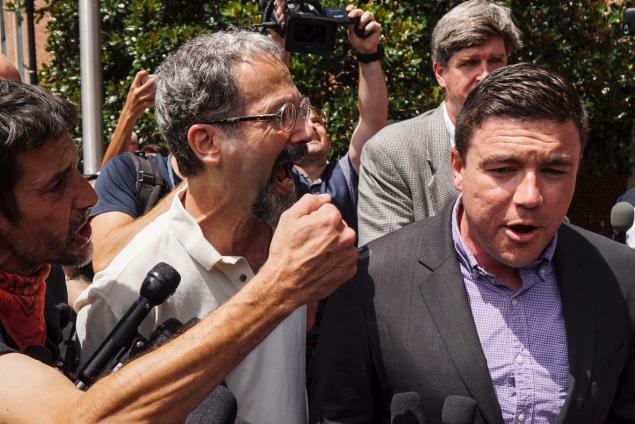 Unite the Right organizer Jason Kessler being assaulted while attempting to hold a press conference. The recent coordinated attempt following Charlottesville to smother the Right has forced a renewal of the ancient debate surrounding censorship—what it is, when and if it is ever justified, and how to combat it in those cases that it is employed unjustly. There are many reasons to be pleased that this question should be so hot in public discourse at present, not least because the manifest injustice of the treatment of members of the Right, from any even remotely liberal point of view, might very well redound to our benefit in the long run. It is to be hoped that some portion of the wider populace will perceive the absurdity of the double standard which is wielded against us, and also the dangers inherent in these enormous “private” companies like Facebook, Twitter, and PayPal, which are able to inflict their arbitrary will on increasingly sizable portions of the agora. To be sure, to pray for a world in which taboos utterly vanish and everyone can speak his mind on anything at all is not only to hope for a chimera, but also betrays a somewhat tenuous sense of the sacred and profane. A healthy society, far from having to impose clear limits on what is and is not acceptable in public discourse, simply possesses such limits, and but seldom transgresses them. On one side, it is reverence which imposes these rigorous boundaries, and on the other, noble taste. The trouble is that we are not living in a healthy society, and the bonds which presently restrict our speech have nothing to do with reverence nor with taste. Indeed, on the contrary: the present taboos are being actively manipulated by malign and often extraordinarily vulgar influences aiming at our silencing and ultimate ruin. We need not mention the forces which are responsible for employing this word as a bludgeon against us. The readers of Counter-Currents are surely well-informed on this point. Neither is it necessary to demonstrate the inherent weaknesses in this concept; a great deal of pertinent and useful thought has been submitted toward this end by numerous figures of the Right. Let us rather, for a moment, take a wider view. Already in the very existence of these debates and investigations, something curious and untoward is happening. We set about trying to get to the bottom of the word “racism” intellectually, even as we might do with any number of more or less neutral terms of continuing importance, like materialism or spiritualism. We treat this “racism” as a kind of intellectual datum which is merely in need of proper clarification and comprehension. But in point of fact, the concept itself is of recent origin, and it is anything but neutral. It is a word founded on an inherent bias—and that alone should awaken us to the peril it contains, and to the difficulty of building anything upon it other than what has already been built. Suppose some new kind of Communist accused a man of being a “workist,” and defined this term as “a man who, because he would rather be well-paid for his labor, evinces ‘prejudice’ and even ‘hatred’ against the poor, and manifestly and unjustly considers himself ‘superior’ to them.” It is evident that the man to whom this epithet was applied should fling it off as ridiculous. But supposing, for some obscure reason, he did begin to dispute the meaning of the term “workist,” tacitly acquiescing to the accusation it contained but attempting to twist it to his advantage—well, would the Communist not be simply delighted at this turn of events? And if all of society then somehow began freely employing this term, and it became common currency to accuse this or that working man of “workism,” and a debate on this concept began to rage in the public forum—would this not indicate a decided victory for this new Communist movement, which, even before the advent of this word, could not have even articulated certain of its own concepts regarding “work” in ways that most people would understand? Should these new Communists not count it a triumph simply that this word has become a part of the lexicon, only because it had begun to reframe the “structure of thought,” so to speak, of the common man? This is precisely the situation in which we find ourselves today with this little word “racism.” Indeed, we are at a far advanced stage of that process. The word is anything but ancient. Its first recorded use does not precede the turn of the last century. It has been suggested that its wider acceptance is owed to its appearance in a work by none other than Leon Trotsky—a claim which, whether it is true or not, is suggestive. This much is certain: it gained popularity during and especially following the Second World War, and was invented or immediately co-opted to be used as propaganda against certain ideas and political forms (most especially Nazism) which never themselves employed the word. Its intent from the start was polemical. (For more, see this very informative essay by Sam Francis.) And to that extent, our attempts to change the spirit of the word are doomed to frustration from the start. The word has surely never lost its polemical edge and has never ceased to appear under the sign of denunciation and obfuscation. “Racism” was not the first, but it was surely one of the most successful, of a series of terms which employed the suffix -ism in an innovative and insidious way. Originally, –ism, which comes from the Greek –ismos, meant simply a practice or a doctrine. In this spirit, one speaks of “materialism” and “atomism,” and also, in a more contemporary context, of “globalism” and “Communism.” As its counterpart we have the suffix –ist, from the Greek –istes, indicating the adherent of such a practice or doctrine. Thus, it is usual in English to employ it in reference to a profession, as in “artist” or “scientist.” The “racist,” taking this word in its original meaning, would thus denote nothing more than one who studies the human races and develops certain ideas in regard to his discoveries in that field. Clearly, this is far from its accepted meaning today. At some point, these suffixes were subjected to an ideological redefinition; they were transformed into derogatory terms. It would be most interesting to chart the course of this development, but for the present it suffices to clearly define the actual meaning of these suffixes in several contemporary neologisms, such as “sexism,” “classism,” “genderism,” and so on. It is evident that the suffix –ism here indicates nothing other than “a false, a prejudiced doctrine,” or what we contemporaries might (if rather strangely) refer to as a “dogma.” Such an –ism is nothing but an idea with no adequate basis, and no sound scientific or philosophical foundation—quite probably an idea which issues from the darker elements of the “subconscious,” and from any number of disagreeable and “irrational” emotions like hatred, envy, fear, and so on. An –ism, in this particular context, therefore indicates nothing but a debunked or groundless idea adhered to by weak and febrile minds—and precisely to those minds, one applies the –ist. Let us not deceive ourselves here: these suffixes direct the destinies of the words to which they adhere. They form the root value-meaning of those words, and cannot be turned upon themselves. A word is like a man; its character is congenital, and not all the social (or in this case verbal) engineering in the world can finally make it into something it was not born to be. True, words live longer than a human being; it is possible, in certain cases, to fundamentally alter their meanings, given long enough stretches of time and sufficient effort. It is well for us to recall this fact, for such alteration forms part of the highest work of the Right. But we are speaking here at bare minimum of decades, and more often centuries or millennia, and that is time that we of the Right do not presently have at our disposal. Then we must ask ourselves what can be done here and now about this eminently tendentious and all-too-powerful term? If a man calls you a scoundrel, you will not get very far if you attempt to argue the meaning of the word with him, to convince him that it is actually desirable to be a scoundrel, or that everyone is in fact a scoundrel. Better to reject the accusation forthwith, and leave its demonstration to one’s accuser. Then he will be forced to engage you on details and particulars; and there, it is quite possible, and in many cases quite easy, to demonstrate the farcical and mendacious quality of the original allegation. In conversation, it often suffices to return the question to its proposer: when anyone employs “racist” against us, it is useful to demand to know what he means by this word, in good Socratic fashion, and to press him on it, thus putting him on the defensive. It does not take much to show that the word indicates nothing but a caricature of a real philosophical or political position. Generally speaking, it is better to affect a haughty indifference to these terms, rather than to permit them to drag one into the mud from which they first emerged and into which they must ever return. It is obvious, of course, that in certain cases it is impossible to ignore or sidestep the question. Anyone who upholds the cause of White Nationalism, for instance, must sooner or later address the “race issue” directly in one way or another. And here is the real value which the intellectuals of the Right have afforded us in the candid, head-on confrontation of these charges of “racism” which are so universally brought against us. But it is equally clear that if we let the matter lie at these efforts alone, we cannot hope for much success in the future, since we remain, as it were, on “their turf,” and in a way our very participation in this debate does nothing but augment their strength. For it is they who have set the terms of battle, and they who have chosen the ground, which they know well since they themselves formed it. We thus remain forever in a handicapped defensive position. Here we find the very deepest sense of the word “censorship”—the censorship, not of speech, but of meaning and value. This is a censorship built into the structure of our language by “interested” parties. It delineates, with lines of power whose very invisibility forms an essential part of their influence, the realms of “acceptable knowledge” and “acceptable speech.” It exploits the enormous reservoirs of shame which previous religious epochs have accumulated in the human soul, and redirects them toward the quiet and subtle channeling of conversation and contemplation. And it casts into the frightful shadows all those ideas, issues, problems, and topics which threaten or offend it. It is evident that we cannot battle this kind of censorship without understanding its mechanisms and turning them to our favor. It is informative to consider the Latin root of the word: it comes from the Latin verb censere, meaning “to judge, to esteem, to decree.” A word is “censorial” in this sense: it contains judgement, and it imposes this judgement on sense itself. In this spirit, it is fit for us of the Right to meet censorship with censorship. As an example in the present case: it would be well for us to invent some neologism, which is the spiritual opposite of “racism” and which can be used in swift response to accusations of racism—something like “mediocritism,” for example, to indicate the beliefs of one, the “mediocritist,” who has become contemptibly indifferent or even hostile to human quality and excellence. It does not matter if these words at first mean nothing to those we use them against. One hundred years ago the word “racism” would have fallen on similarly deaf ears. It is the intent which is key; it is the justice which we carry, the simple, confident presupposition that it really is despicable, risible, and wretched to live as if there were no fundamental differences between man and man. The determined use of tactically conceived concepts on our part is the essential first step; the rest, given our consistency and our insistency, will follow of a course. And if such terms can be made a part of the popular discourse, even if only marginally, they might have a proportionate effect. The history of modernity has without any doubt shown that this is true. The Left has a decided advantage over us in the fabrication of such language; intuitive knowledge of the popular mindset is its peculiar heritage. Even beyond the fact that its historical connections to the “proletarian” movements and its present obsession with all kinds of “minority issues” and “social ills” render it naturally more sensitive to the common mindset, even its so-called “elites”—its George Soroses, Rockefellers, and Bill Gateses, for instance—are for the most part nothing but capitalists, which is to say, common men writ large. These “elites” owe almost their entire instinct in these matters to precisely that origin—though they themselves surely take it as another aspect of their entitlement to rule. But a true ruler, which is to say, a true aristocrat, knows as little about that kind of purely manipulative and demagogic “command” of the “people” as an upstanding citizen knows about successfully playing the part of the strong-armed pimp in a bordello. Nonetheless the Alt Right in particular has demonstrated a degree of inspiration in the production and employment of novel and efficacious terms. One thinks of such happy inventions as “cuckservative,” “redpill,” and “social justice warrior,” though a goodly portion of the so-called “meme war” ultimately has no other purport. With concentration and discipline, these particular tendencies might be turned to our advantage. But it is a truism that if the archer does not know where to direct his arrow, he shall never hit the target. Rather than consuming our energies in continuously defending ourselves from the veritable stream of partisan jargon which oozes eternally about our heels, we would be well counseled to attempt to fashion the active counterparts to this contumely. That requires clear knowledge of what it is we are aiming at and what kind of society and principles we are proposing to the world. It requires clarity in our spirits, and also the inner strength to which Chad Crowley recently and so justly incited us. It requires, in other words, positive points of reference. Only if we begin to work from such an affirmative position as this, rather than from this continual and continually disadvantaged, if necessary and often creative, defense, can we ever hope to put ourselves on the offensive with respect to this most powerful and most secret censorship. Published: September 8, 2017 | This entry was posted in North American New Right and tagged Alt Right and language, articles, censorship, John Bruce Leonard, language, methods of argumentation, North American New Right, originals, racism, terminology, the left. Both comments and trackbacks are currently closed. I’d like to see the label “trogressive” gain traction, as “cuckservative” has. This neologism slurs progressives (progressing towards what?) with troglodyte, for that’s what they are — and would have us be — cave-dwellers, inmates in their sensorily-deprived, controlled mass anesthesia. It also has a pleasing condensed form, rather like “prole” or “cuck.” Doesn’t “trog” roll nicely off your tongue? Like blind salamanders, trogressives have for so long ceased using their vision that they’ve lost it. In their fury, they can only lash out at sighted kind. It’s time we started calling attention to their willful blindness and having fun at their expense. All for the sake of the White race. My thanks for your comment, Lifthrasir; it demonstrates precisely the attitude I think we should strive to adopt. Highly recommended for reading, and immediate use. If accused of being a “racist’ by a leftist, simply request he stop othering you. Hell it’s worth a shot. Yes, as Confucius said, the first step in real change is “rectification of names” or the correct use of words. And our Doom was sealed when we accepted the words the Left came up with such as “racist” and “anti-Semite” without question. Now they have all the force of a venerable tradition and have the power of spells to silence and destroy. Meme Magic is our Counter Spells, White Magic against their Black. A worthy metaphor, Jaego, and I am quite in agreement with you. I think one of the most effective parts of this counter-offensive is to be found in laughter, which is a key part of the “white magic” you mention. We should have humor and cheer in the face of these absurd accusations, rather than merely indignation and rage, which is not near so efficacious—particularly because there is something about indignation and rage which merely seems to corroborate the slander contained in the original terms. I very much doubt a word like “racism” can be shouted down; but perhaps it can be laughed out of court. I have noticed for a long time that the political LEFT, the owner of American/western culture due to dominating the three institutions that determine that culture i.e. academia/news/entertainment, will try to zip its opponents/targets up into what I call a “slander bag”. They stick labels such as racist, supremacist, extremist, bigot et alia onto their target and then force the target to disprove the accusation. On news program interviews this is particularly effective for the political LEFT because as soon as the target has spoken one maybe two sentences toward clearing up the slander the interviewer claims there is only so much time and they “want to move on and cover other topics”. No refutation of the slander but the labels stick nonetheless. It is akin to the practical joke of someone being shoved into and locked up in a locker in gym room. If the target sits meekly and waits for someone to come to their rescue, they look bad. If the target thrashes about and tries to free themselves but fails, they look bad. If they thrash about and finally free themselves, they still look bad. The only way to never look bad when being targeted for this is to preempt it or otherwise derail it, usually by doing something to make the jokester look the fool. The target of being zipped up in the slander bag must not let the LEFTIST proceed with anything else they plan to say. The label must be denied, rejected and called bogus/illegitimate/etc. Interrupt them, talk over them, shout them down if necessary, but do not let them proceed with the debate/discussion after they apply those labels. So what if the interview, or debate or whatever the situation is does not get anywhere because the target of labeling ground it all to a halt? That is perfectly acceptable. What is not acceptable is to be, yet again, repeatedly defamed, slandered and impugned with these name calling labels. The LEFTIST might try to justify the label with the target and this will give the target the opportunity to demonstrate that the -ist labels of racist, extremist, supremacist are bogus for two reasons; 1) the labels are not used true to the root words of “ist” and “whatever” and 2) the LEFT does not apply to themselves whatever definition they have determined and use on their target. It probably won’t get this far, though. So many on the right, alt-right or other right, fall into this labeling trap. Even if most on the political Right do what I described above, the LEFT would cease trying to interview those and use the few remaining political Right who fall for the trap. The resulting image is that the political Right is agreeing to the labels and then we’d be back to square one. I have noticed over the years the MSM (undeniably LEFTIST) always have milk toast “conservatives/Right” on their interview programs, never any strong/capable on the Right. The resultant image, if that is all anyone watched, is that the Right are defensive and apologetic about being political Right. Many thanks for a most interesting response, ster plaz. I agree entirely with your diagnosis of the situation, and most especially the essential importance of avoiding and resisting all “labeling.” This is most difficult, not least of all because the Right has already lost a lot of ground in the mere acceptance of these terms as legitimate. I continue to think that the mere rejection of these terms is inadequate, for we remain ever on the defensive, ever in the position of fighting to keep out of the locker, to use your most apt metaphor. We must seek to a position of comparative strength. We are in need of an offensive language of our own. Thank you. An overall decent synopsis of censorship in confict, it’s simple skin-thick philosophical bases, & reiterates the cultural & linguistic in the racial condition of (esp. Occidental White) Man. Although often disagreeable in our forums, linguistic, relativism is useful here. However in this instant piece, the author’s choice of exemplars may hold less water. Our concern is with the welfare and future of the White race, so why should we not say so. One can add, that one does not judge a person by the colour of their skin – we all know plenty of Whites who are hostile to the interests of our White community. Mr. Edmonds, you make a good point. I have no doubt that “keeping things simple” as you suggest here is in some cases not only sufficient, but even quite desirable. But tell me if you can not easily imagine the following consequence of your suggestion. After you issue your qualified definition of racism, the person with whom you are speaking, in a certain sense even taking you at your word, then begins to go about telling everyone that you are in fact a racist, that you even admitted to being a racist in a conversation with him. Now, I think you’ll agree that anyone who hears this certainly will not have the least idea of the qualification you have made to the term “racist.” They will take “racism” in the conventional sense that I have outlined in my article. And now you, to countless individuals, and perhaps many you have never even met, will become that bugbear which the liberals call “racist,” which clearly has little or nothing to do with what you meant to say. And the specific and hidden stains that this idea will fling upon your name are not easily erased. I do not doubt, of course, that such rumor-mongering can happen even if you follow a different strategy, or deny the term altogether, or what have you. Indeed it happens daily. But to my mind, the less force that we give to such processes, the better. They must ever remain unambiguously what they really are: campaigns of slander. My concern for the welfare of the White race is the simple truth of the matter. In my experience journalists find my rejoinder unanswerable. To spell it out what I am attempting to achieve here: journalists are the outer edge of the System; they are so to speak the shameless lackeys of the System, and to beat them in verbal combat, to turn the polemical edge of their word-weapon, is to defeat an important part of the System. If and when millions of Whites adopt this simple and obvious rebuttal of the term “racist”, then this System might well collapse. As you say in your article, this whole business, “the secret silencing” is just all about words. As children in the school yard we used to sing, “Sticks and stones may break my bones, but names will never hurt me. ” Are you familiar with that in the USA ? I agree with all that you have written, Mr. Edmonds. And given your work in the field, I of course would not presume to dictate methods to you. I am quite content to defer to your experience, which is wider than my own; and if you find the results of your approach satisfactory, then that is quite sufficient demonstration its efficacy. I firmly believe we are in dire wont of public figures who are willing to proclaim pro-White positions with the candor and courage which you evidently display—for which, you have both my compliments and my respect. So far as the wider question is concerned, let me emphasize that I am hardly recommending any kind of craven avoidance of these issues. On the contrary, speaking out on these matters frankly and openly, as you do, is one of the best means we have for dispelling the murk which has been gathered round them. I wish only to indicate (as I am sure you will agree) that not only the substance but also the manner of our speech is important. The left has been responsible in the last several centuries for a sophisticated and generally self-conscious manipulation of the lexicon toward the hidden end of promoting their ends, and castigating ours, and this has been done often enough with little enough reciprocal action or even awareness on the part of the Right. This extends far past the specific term “racism,” and it would would be well for us to meditate on this. In the States our schoolchildren sing the song you mention, but I might wonder how far its truth extends past the playground. “Names” in our day increasingly lead directly to all manner of “sticks and stones”—indeed, in some cases quite literally. What has happened to any number of individuals during and after Charlottesville for their putative involvement in “Nazi” or “racist” movements demonstrates this, and I do not foresee that matters will soon improve. Language as language has a potency which we neglect at our own loss. And indeed, your particular practice, Mr. Edmonds, provides an excellent example of how the conscious use of our tongues can contribute to the attainment of specific and well-defined goals. This is not about saving me or you, but saving the White race. Many thanks for the tip regarding Lifton, Proofreader. I am unfamiliar with his studies, but I will look into them. At first glance it appears interesting indeed—though I suspect it would require a certain degree of special work to apply his ideas to our peculiar quandary in the Right. We are very much in need of our own investigations into these matters from the perspective of the Right. The approach of men like Lifton could well supplement those investigations; it cannot substitute them.